Yes, this is a rather odd one but it was 140 years ago this month that, on the 10th April, 1877, 14-year-old acrobat Rossa Matilda Pitcher (stage name Zazel), became the world’s first “human cannonball”. ‘Zazel’ was launched into the air by a special ‘cannon’ – invented by Canadian William Leonard Hunt (aka ‘The Great Farini, he was a famous tightrope walker), it used rubber springs to propel the person forward – in an event at the Royal Aquarium in Westminster. She apparently flew some 6.1 metres before landing in a net. Zazel later went on to perform in PT Barnum’s circus but sadly, in 1891 she was forced to retire after an accident in New Mexico during which, thanks to a net mishap, she landed badly and broke her back. 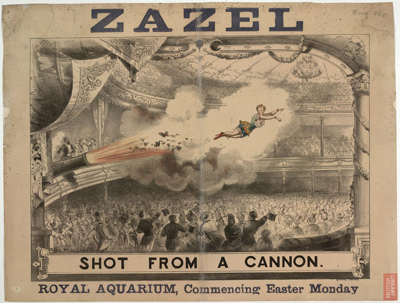 It’s worth noting that there is another claimant to the title of first human cannonball – some accounts have the “Australian Marvels”, a couple named Ella Zuila and George Loyal, first performing such an act in Sydney in 1872 (which, if true, would predate Zazel). Guinness World Records, however, has awarded the title to Zazel. The Royal Aquarium, meanwhile, opened in 1876 in Tothill Street, west of Westminster Abbey, and was demolished in 1903 (we’ll look at its further in an upcoming Lost London post).